While the story of the big has often been told, the story of the small has not yet even been outlined. With Dust, Joseph Amato enthralls the reader with the first history of the small and the invisible. 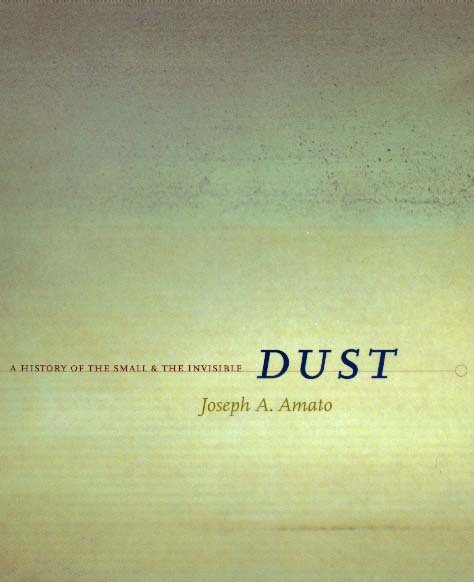 Dust is a poetic meditation on how dust has been experienced and the small has been imagined across the ages. Examining a thousand years of Western civilization—from the naturalism of medieval philosophy, to the artistry of the Renaissance, to the scientific and industrial revolutions, to the modern worlds of nanotechnology and viral diseases—Dust offers a savvy story of the genesis of the microcosm. Dust, which fills the deepest recesses of space, pervades all earthly things. Throughout the ages it has been the smallest yet the most common element of everyday life. Of all small things, dust has been the most minute particulate the eye sees and the hand touches. Indeed, until this century, dust was simply accepted as a fundamental condition of life; like darkness, it marked the boundary between the seen and the unseen. With the full advent of scientific discovery, technological innovation, and social control, dust has been partitioned, dissected, manipulated, and even invented. In place of traditional and generic dust, a highly diverse particulate has been discovered and examined. Like so much else that was once considered minute, dust has been magnified by the twentieth-century transformations of our conception of the small. These transformations—which took form in the laboratory through images of atoms, molecules, cells, and microbes—defined anew not only dust and the physical world but also the human body and mind. Amato dazzles the reader with his account of how this powerful microcosm challenges the imagination to grasp the magnitude of the small, and the infinity of the finite. Joseph A. Amato is Dean of Rural and Regional Studies at Southwest State University in Marshall, Minnesota. Some of his most recent titles include Golf Beats Us All (So We Love It) (1997); The Decline of Rural Minnesota (1993); The Great Jerusalem Artichoke Circus: The Buying and Selling of the American Rural Dream (1993); and Victims and Values: A History and Theory of Suffering (1990). Conclusion: Who Will Tremble at These Marvels?